BTVI is a 24-hour English news channel in the Business-Economy genre. The news channel's coverage ranges from latest news on Business, Industry, Markets, & Stock Verticals to Economy, Policy, Banking, Technology, Telecom and Personal Finance. BTVI disseminates real time news through multiple platforms like television, web and mobile. Basis the shows that the anchors hosted, we used the topics that they spoke on to highlight the show as well as draw attention to the anchors. We drafted creatives that portrayed the anchors. These creatives were in individual and group formats. 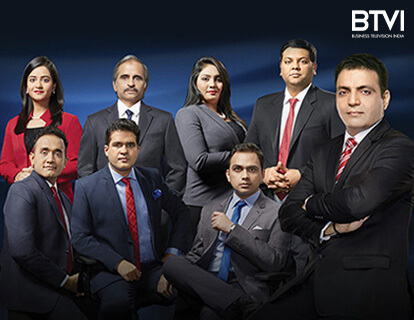 To launch the Brand Campaign, creatives were designed portraying the core editors and anchors of BTVI. The idea behind this was to highlight the expertise of the anchors in giving opinions that would profit and benefit the viewers. G5 Creative: This was a creative highlighting the 5 key anchors and editors at BTVI. Essentially, it spoke about how these anchors are specialists in their field and how their ‘Opinions’ are of prominence. G8 Creative: Two weeks following the release of the G5 creative, the G8 creative with 8 key anchors and specialists at BTVI was put out on the social platforms, with the hashtag #ProfitFromOurOpinions. This was to convey the users that they can benefit from the ‘Opinions’ of the anchors. This was in lieu of #OpinionsThatCount. Impactful Creatives: We also designed creatives with impactful statements about the anchors to highlight their area of expertise. The idea behind this was to position the brand in light of the anchors and the level of expertise they bring to the table. Cover Skins: The cover skins were changed across Facebook, Twitter and YouTube.